MOSCOW (AP) — The impact to his head was so violent that Noureddine Amrabat can’t remember the World Cup match at all, even though he was playing in it. “Five, six hours, gone. Totally gone,” the Morocco midfielder said of the concussion sustained in his team’s opening match against Iran. Five days after a clash of heads sent him to hospital for a brain scan and 24 hours of medical supervision, the 31-year-old was back in the Moroccan lineup Wednesday and played the entire match in a 1-0 loss to Portugal, in defiance of FIFA guidelines and his team doctor. 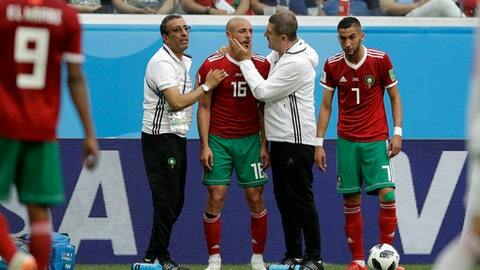 Despite having expressed shock about Morocco’s initial pitch-side treatment of Amrabat’s concussion last Friday, tournament organizer FIFA absolved itself of any responsibility in the team decision to field him again so quickly. Amrabat wore a padded skull cap for a quarter-hour but took it off because he was too hot. After the initial concussion diagnosis, Morocco team doctor Abderrazak Hefti had said Amrabat wouldn’t even train for a week. But the player said that he overruled the physician. This wasn’t the first time that concussion management in football has come under the spotlight at the World Cup. Jolted by criticism of concussion cases at the 2014 tournament , FIFA introduced guidelines intended to provide players with better protection and give team doctors more authority. Moroccan team officials appeared to ignore the guidelines after Amrabat collided with Iran midfielder Vahid Amiri on Friday. Television images showed the apparently dazed Amrabat being sprayed with water and slapped on the face, seemingly to wake him from his stupor. “There was a very clear concussion and we have instructed them very clearly and we spoke about the importance of proper treatment, which is why I was surprised at seeing the behavior on the touchline,” FIFA medical chief Michel D’Hooghe said Wednesday. FIFPro said Amrabat shouldn’t have played again so soon. The new case comes amid rising concern in soccer about the risks of concussion and the potential degenerative damage to players’ brains from repeatedly heading balls. Britain’s associations are funding a study to try to determine whether players are more prone to developing dementia. Other sports have more rigorous concussion protocols. NFL players with concussion symptoms during a game are examined both by the team doctor and an independent neuro-trauma expert approved by the league. The team doctor decides whether a player suffered a concussion, with consultation from the independent expert. Players diagnosed with concussions start a five-step protocol that includes additional testing as the player progresses from light exercise to football contact. There is no time limit, but it generally takes five days or more. The NFL diagnosed 281 concussions during the 2017 season.